Ladies, imagine that you are the person being gazed at by the man above. Say, won't you just melt on the spot or feel butterflies in your stomach? 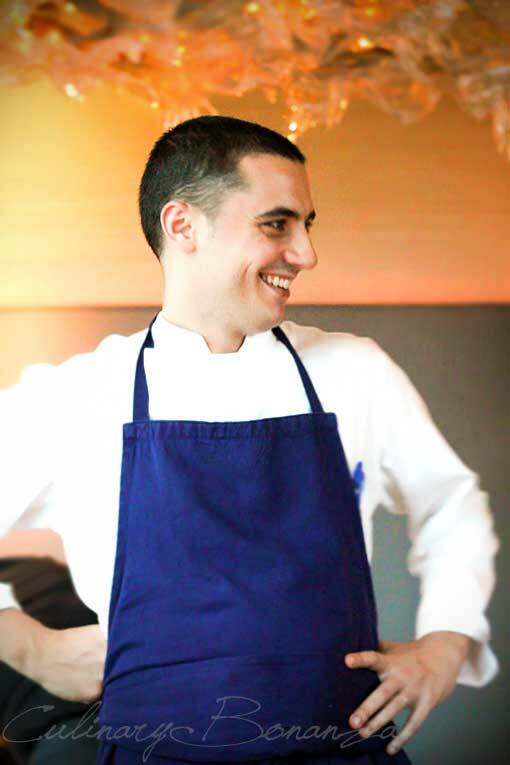 The second chef featured in this little antique section of my blog 'Too Hot for The Kitchen', is Julien Royer, who is 100% French, 100% charming and 110% talented. Just for the sake of convincing you about his credits, since he joined JAAN as its Chef de Cuisine, numerous prestigious awards have found its way both to him and to the restaurant. 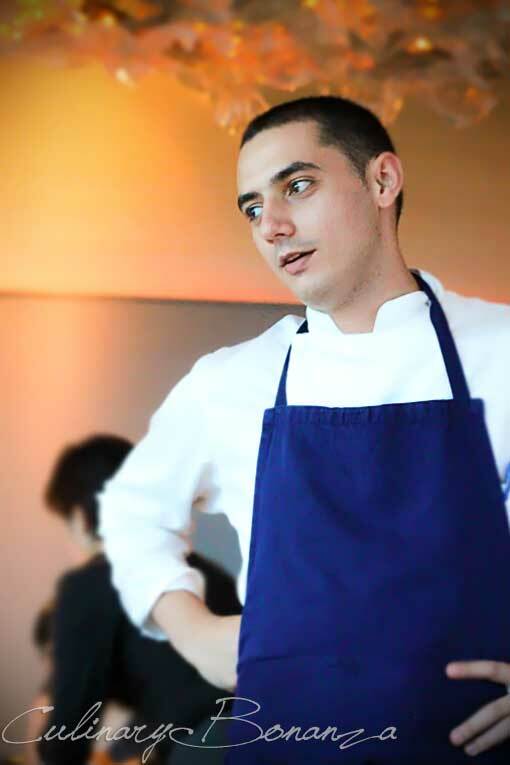 Just to name a few: he was awarded Rising Chef of The Year in 2012 World Gourmet Series and earlier this year, 'The One to Watch’ Award in S. Pellegrino’s Asia’s 50 Best Restaurants 2013. If you have been following this blog, you'd recall the post about Asia's 50 Best Restaurant Ceremony and about my experience dining at JAAN. So I'm not going to elaborate about his background anymore, which you can also find here. Instead, I'm going to share how he's special and more than just looks. The first thing I noticed about Julien is that he speaks good and comprehensible English, for a French. Most likely from his long experience in London and Singapore. His amicable and chatty persona was an inescapable ice-breaker. Mentally unarmed, you'd find yourself suddenly talking easily to him, who had been just another stranger moments ago. Julien wouldn't hesitate to approach your table and present to you, his creations, done personally, no other staff needed. When I asked how he stayed fit despite being around food everyday, he disclosed his habit to bike to work. Despite his French roots, even Chef Julien can't resist Chili Crab and Laksa. Got to tell you that he makes an epic caramel-like spread, which were given to us in small jars. If you think that Nutella can never go wrong, wait until you taste his magical spread! Try not to look too closely at the photo above, because you'll find something that'll break your heart. :( Oh well, Julien is not available, but at least his brilliant cookings will always be!